This article is about the province in Cuba. For other titular locales and uses, see Guantanamo (disambiguation). 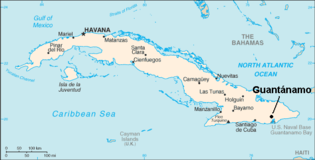 Guantánamo is the easternmost province of Cuba. Its capital is also called Guantánamo. Other towns include Baracoa. The province surrounds the important U.S. Navy base at Guantánamo Bay. Guantánamo's architecture and culture is unlike the rest of Cuba. The original settlement was done by Catalan families from the Ampurdan region of north-eastern Catalunya, Spain in 1764. British forces had occupied the area for over 40 years and Scot-Irish settlers were a constant preoccupation to the Spanish auhorities. In 1805, when the French were forced out of St. Domingue (Haiti) 35,000 French settlers were given lands in Cuba, many French families settled in the Guantanamo area becoming coffee and cacao planters meaning that many buildings are comparable to those of the French Quarter of New Orleans in the U.S. state of Louisiana. Before the Castroite Revolution the Carnivals of Guantanmo were famous in Cuba. The province is only 80 km away from Haiti its closest point, across the Windward Passage and close enough to see lights on Haiti on a clear night. Guantánamo also has a number of immigrants from Jamaica. The Nipe-Sagua-Baracoa mountains (Sierra de Cristal) dominate the province, dividing both climate and landscape. The northern coast, battered by prevailing winds, is the wettest part of the country, while the south, sheltered and dry, is the hottest. The north is characterized by rainforests, while the south is arid and has many cacti. This page was last changed on 15 April 2018, at 03:09.